Film Review: ‘The Last Stand’! Arnold Schwarzenegger once promised us he’d be back. Well, he completely delivered on that promise. 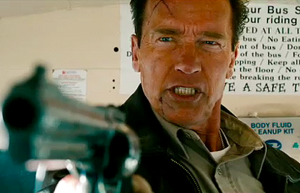 It’s been over 9 years since Arnold has headlined an action film, the last being ‘Terminator 3: Rise of the Machines‘. And now, Arnold is back with top billing in an action film. The question is, does he still have same chops and draw that he did a decade ago? With its paint-by -the-number plot line and a 65 year old Schwarzenegger, you might think the worst. However, the ‘R’ rated film, while a bit slow in the beginning, takes off with huge action beats and a plethora of violence, mixed with a bit of comedy, making it a lot of fun to watch and a decent welcome back party for Schwarzenegger. Before viewing the film, I was questioning the former Terminator’s age giving him a backseat to an action film. Sure, we have seen older actors such as Clint Eastwood and Tommy Lee Jones still take on heavy action roles with ease, but Schwarzenegger always out-did them in the form of physical aspects. Well, with Korean director Kim Jee-woon’s ‘The Last Stand‘, Arnold proves he still has the chops to handle guns, jump through windows and fight bad guys. Although, unlike his films from the 80s and 90s where if Arnold were to take a few blows to the body, he was quick to get back on top. But here, it takes him a bit longer to wipe off the injuries, which proved more realistic. And even when he jumps through a glass window, he says the famous “I’m too old for this’ line, to which another character says, ‘No, you still got plenty years left in you.” It was laughable, as we were force-fed that joke, but that’s what the whole film felt like. This was Jee-woon’s first film for America and it starred one of the biggest actors in history, and to top that, this was his first come-back film in over a decade, and instead of making a film with depth, it was more of a welcome-back party for the former Mr. Universe. Now, I have seen a few of Jee-Woon’s films, most recently his ‘I Saw the Devil’ movie, which is amazing. However, with ‘The Last Stand‘ the director ditches all of the suspense and tense situations and just goes for the action. There is no build up. Schwarzenegger plays Sheriff Ray Owen, a once epic cop in Los Angeles, who has moved to a small rural desert town in Arizona, where life is slow and sweet, and where one of the only crimes is double parking. However, a few hundred miles north in Las Vegas, a big-bad Mexican cartel leader Gabriel Cortez (Eduardo Noriega) is being transported to another prison led by FBI agent John Bannister (Forest Whitaker). As you can imagine, things go awry, and Cortez escapes with one of the female FBI agents as his hostage (Genesis Rodriguez) in a Corvette ZR1, which has more than 1000 horsepower and can go over 200 mph. Cortez has planned an elaborate escape to Mexico, as he has hired dozens of minions to help clear the roads from police or any roadblocks along his trek to Mexico. Much to Cotrez’s lack of luck, Sheriff Owen’s town just happens to be right on the border of the US and Mexico and is where Cortez plans to make his crossing. Once the Sheriff finds out about the bad guy heading his way, he enlists the help of his deputies Figgie (Luiz Guzman), Sarah (Jaimie Alexander), and Jerry (Zach Gilford), along with a decent citizen of the small town, who happens to be in jail Frank (Rodrigo Santoro aka Xerxes from ‘300‘), and Lewis, the town idiot (Johnny Knoxville) to stop Cortez from entering Mexico. Luckily, Lewis has a collection of weapons ranging from a replica of ‘Conan’s‘ sword to a 1939 Vickers machine gun, which he calls the ‘Nazi Killer’, and everything in between. Most of the film is a car chase, with the final act being the standoff in the rural town. Jee-woon’s visual style for this action film seems to have no smooth style or transition from one scene to the other, and like I said above, there is not one ounce of suspense in the film. Instead it goes from straight action beats to the next action beat. However, I thought that part of the car chase with Sheriff Owens and Cortez was in cornfield. There was something oddly beautiful and cool seeing that Corvette and a new Camaro drive through a cornfield. And one of my favorite moments of the film and the one I laughed the most at was the final battle between Arnold and Noriega, which they just use their old fashioned fists and bodies to try and kill each other. This final fight is basically a stell cage match in the vein of WWE, complete with larger than life suplexes, grappling holds, and brutal take downs and closelines. Doing the final fight this way, made it seem more realistic for the 65 year old Arnold to hang with the young Noriega. Guzman and Knoxville proved all of the comedy here as Guzman plays an all-to-willing deputy, while Knoxville seems to play an amped up version of himself from ‘Jackass‘. Whitaker dials it in as the FBI agent, but proves as always, he is a good actor. And then there is Schwarzenegger. Although he is five years from 70, he still sells and delivers the goods, but just now with more caution and is slower to recoup. He had a bit of acting rust from being out of the business for so long, but I bet by his next film, it will be gone. ‘The Last Stand‘ is a fun film if taken with a grain of salt and it is truly great to have Arnold kill the bad guys once again. P.S. – I got to have a very quick talk with both Arnold and Knoxville at the premiere of the film in Dallas, which you can see HERE. 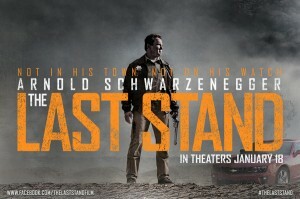 Here is the Final Trailer for Schwarzenegger’s ‘The Last Stand’!!! Blu-Ray Review: ‘300: Rise of an Empire’!! 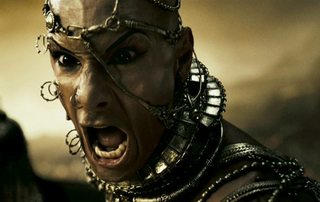 Film Review: ‘300: Rise of an Empire’!! This entry was posted on Thursday, January 17th, 2013 at 5:35 am	and is filed under Film, News. You can follow any responses to this entry through the RSS 2.0 feed. You can skip to the end and leave a response. Pinging is currently not allowed. He knew the risks, he didn't have to be there. It rains... you get wet.